If you want something large and roomy to stand on while waiting for your dream buck, the Summit Dual Pro ladder stand is just the product to get. With its proven reliability and performance, this tree stand will make any hunting trip more awesome for you and give you more meat to put in the freezer. Providing genuine value for money, this ladder stand wins hands down in features and functionality. 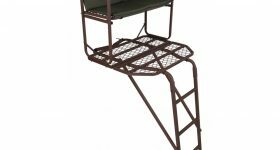 The largest of the Summit line, the Summit Dual Pro Ladder Stand has a full-size platform that gives you so much room it can even take two hunters. With a weight rating of 350 pounds for a single user and 250 pounds each for two hunters, this ladder stand lets you bring along a hunting buddy, your child just learning to explore the intense feeling of hunting, or someone who can take videos of you being your best hunting self. 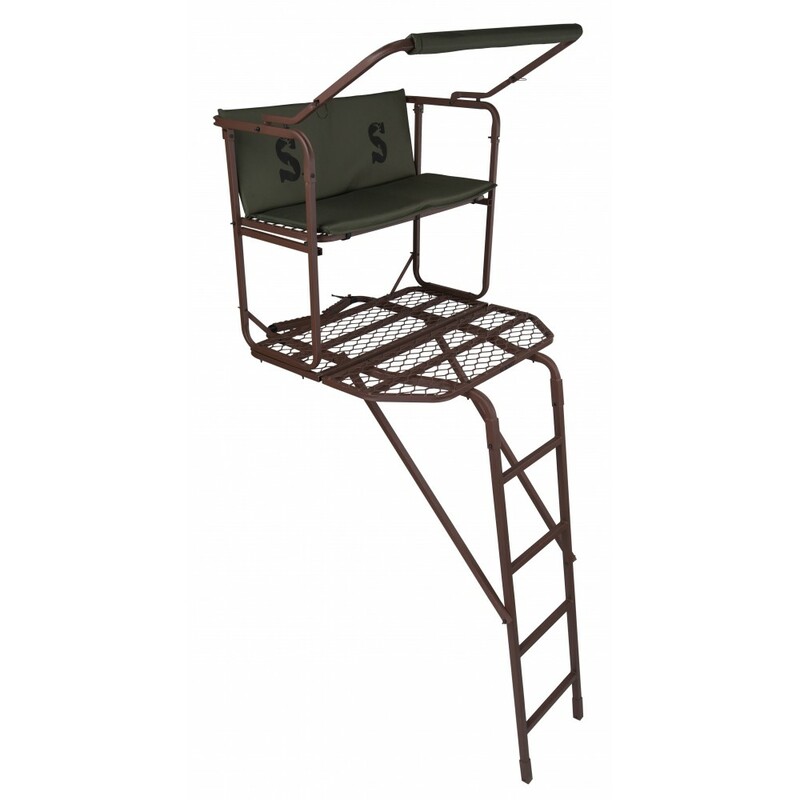 This tree stand’s full and roomy platform allows freedom of movement high up, so you can move around on the stand alone to take a really good shot, or you and your buddy can each take the perfect aim to bring down the buck and see which one of you is truly the fastest hunter in the west. The bench seat is even made wider so you have more room in which to sit and wait while enjoying a good conversation with your hunting partner. This is definitely the best stand to have a first time hunter or a seasoned partner with you on every hunting trip. Designed to last for many hunting seasons, the Summit Crush Series Dual Pro features a tough powder coated steel construction that ensures more than enough protection from product degradation such as corrosion and chipping. The powder coating process employs no solvents or volatile organic compounds (VOCs) to ensure your safety, unlike paint that has harmful chemical components. The coating is twice as thick as regular paint so the tree stand can withstand the stress it is subjected to during use. The tree stand weighs a solid 87 pounds so you can be sure it can support your weight along with the weight of your companion for up to 500 pounds total for two and 350 pounds for just one user. The product ships with a one-year limited warranty, serving as your assurance of dependable quality and strong craftsmanship. Boasting superior attention to detail, this tree stand comes with two 4-point fall arrest systems or safety harnesses that enable you and a hunting companion to go up and down the tree confidently without worrying about your safety. The harness provides enough support for your frame. The unit comes with all the needed hardware, pads, straps and ropes so you won’t need to worry about being protected all the way. The harnesses also have safety straps for added protection, plus an attached suspension relief system (SRS) that allows you to take pressure off your legs while hanging from the harness in case of a fall. The bench seat is made wider for comfort and is supplemented by a backrest so you can just sit back and relax as you wait for the perfect opportunity to shoot. The padded gun rest allows you to position your weapon up front so you won’t have to suffer from hand fatigue after carrying your gun for hours in your arms. The included cam lock stabilizer straps ensure that the tree stand and the user are kept on the tree by keeping the top part of the tree stand stable as you hunt. It anchors the top section of the ladder stand so it stays in place. The tree stand comes with instructions so you know exactly what each component is designed to do and how to use it optimally. The safety/ instructional DVD gives you a first-hand view of how the tree stand is set up and used. This tree stand is perfect for trees with 8 to 20 inches diameter, giving you a wide range of choices on what tree to install the unit on. The included ratchet platform strap makes it easy to install and remove the tree stand. It draws very tightly to provide a safe and secure installation. The platform offers a 15-foot high elevated platform and includes the gun rest that adds an extra 3 inches height. The sturdy low hand rails offer support as you move around while providing extra clearance for bow hunting.